Until O.J.Simpson snatched the title, The Hiss case was the Trial of the Century. But very unlike Simpson, Hiss really was an innocent man; his is a true case of the Emperor's new clothes. A fantasy. A chimera. None of it was real except the pain it inflicted. 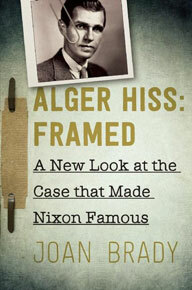 Most Americans who have heard the name Alger Hiss assume he was not just a spy but a traitor like Benedict Arnold. What they don't know is that there is nothing - absolutely nothing - in the secret service archives of either the Americans or the Russians to hint he might have harboured so much as subversive thoughts. The FBI and CIA gave up looking for evidence of subversion ages ago; they say so on their websites. The Russians agree. As one researcher put it, “I am ready to eat my hat if someone proves the contrary." Hiss had filled increasingly important posts in the State Department; he'd been the organising Secretary General of the United Nations, President of the Carnegie Endowment for international Peace, was thought by many as a future Secretary of State. Instead he became Prisoner 19137 at Lewisburg Federal Penitentiary, a fall from grace on a Biblical scale. How could such an absurdity happen? The answer is simple: Richard Milhous Nixon. Nixon was the inventor of "Fake news". He created the Hiss case out of whole cloth. The prize for his invention? Same as Trump's: President of the United States.